While repowers seem to be all about new engines, the running gear needs the right amount of attention. 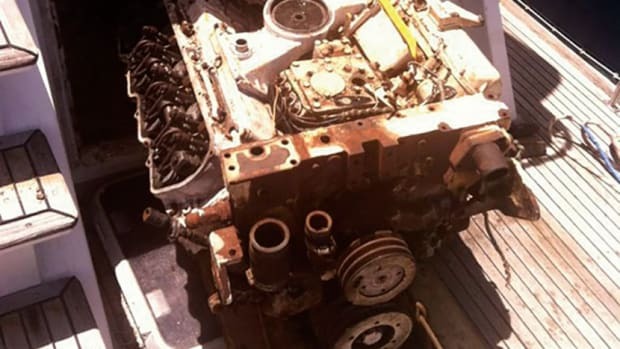 Repowering a diesel boat—like Arawak, the 1996 Grand Banks 42 motoryacht we’re rehabbing in the U.S. Virgin Islands (follow the MyBoatWorks project at www.betterpowerboat.com)—can be a complex endeavor. 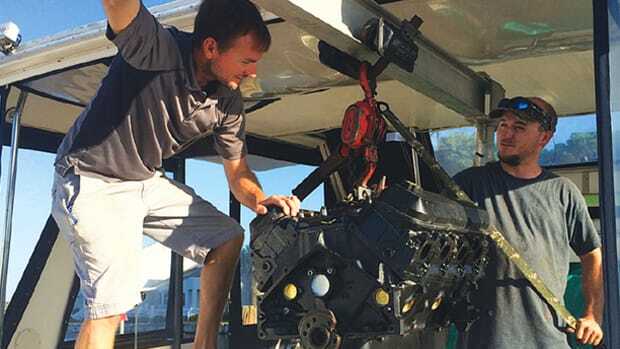 For starters, there are a host of devilish details to contend with during such a big project, especially if it entails swapping out an older naturally aspirated powerplant for a set of modern, common-rail, high-speed diesels like the 220-horsepower Yanmar 6BY3-220s that have just recently gone into Arawak’s machinery spaces (for more detail on the swap, see: “Out With the Old,” November 2014). Said details include, among other things, developing engine beds that are compatible with a contemporary (read: smaller) diesel-engine footprint; picking out, sizing, and purchasing adapters and other components that will facilitate electrical-, raw-water-, electronic-, and propshaft-related hookups once the new engines are properly installed and bedded, and resolving stability issues that can sometimes arise when hefty (read: older) engine weights are exchanged for sprightlier (read: modern) ones. 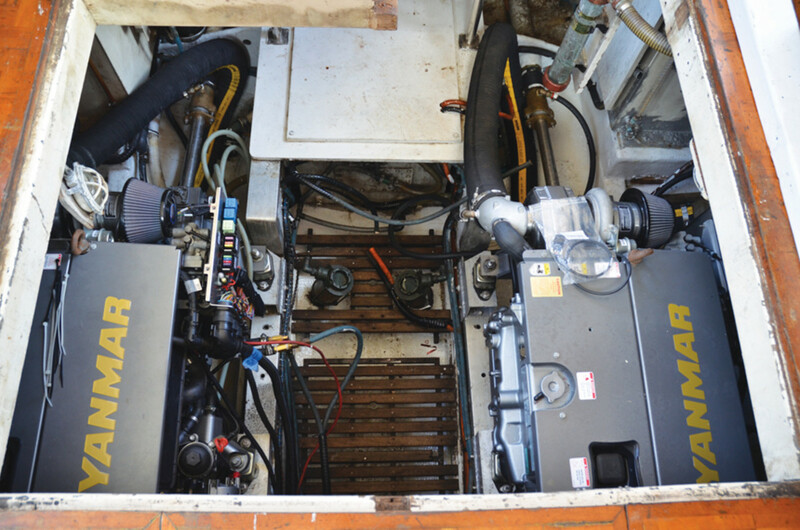 And then there’s one more sticky little issue, a problem that arises during many, if not most, repower projects today—the synergy that must be established between the new powerplant and the boat’s propeller or propellers. A challenging exercise? Most assuredly, and one that’s best left to experienced professionals, at least in the majority of cases. Indeed, to achieve this synergy on Arawak, a raft of experts were either consulted or called in to participate directly. 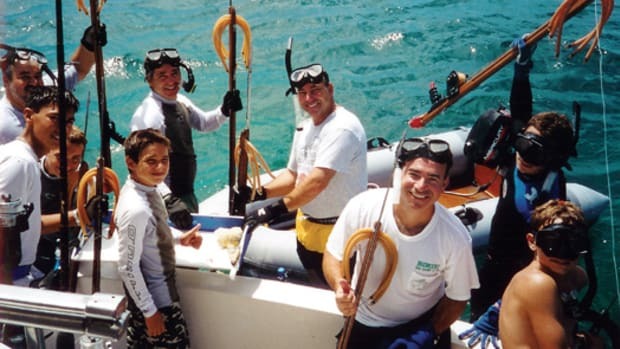 From her owner (and rehab chief) Tommy McCoy, to the repower specialists from both Mastry Engine Center of St. Petersburg, Florida, and Mack Boring of Union, New Jersey, to the techs of Offshore Marine and the propeller gurus of General Propeller of Bradenton, Florida…a raft of folks have contributed mightily. A significant difference in rotational engine speeds was at the very heart of the challenge. While Arawak’s original set of 210-horsepower Caterpillar 3208NA engines closely matched the new Yanmars in terms of horsepower, they were larger and heavier (by approximately 2,000 pounds each, according to the Mastry folks) and turned considerably less rpm per given amount of horsepower. More specifically on the latter score, wide-open throttle for the CATs was just 2800 revs, while top hop for the new-age Yanmars is 4000 revs, a considerable disparity that dictated the necessity for some critical modifications. The first involved the boat’s old transmissions, which coupled Cats and props with a fairly deep gear ratio of 2.5:1. They needed to be replaced with up-to-date transmissions that offered an even deeper ratio so that the higher revs of the Yanmars would be at least somewhat reduced at the prop/water interface. To get a bit more specific, the Kanzaki trannies that were fitted were set up to turn a 2.67: ratio, a scenario that at least began closing the gap between the wide-open-throttle rotational speed of 1120 rpm that Arawak’s props saw with the CATs (dividing 2800 by 2.5 equals 1120) and the wide-open-throttle rotational speed of 1498 rpm (dividing 4000 by 2.67 equals 1498) that the boat’s props would see with the new engines. This modest reduction was far from enough, though. 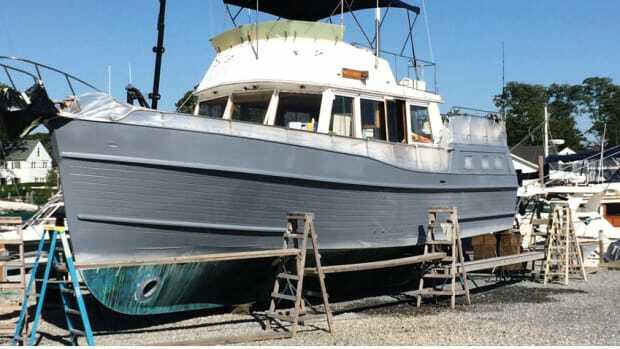 Although Arawak’s props would see fewer turns via the new trannies than they saw with the old, they were still going to put way more oomph into the water than the boat and her new engines could handle long term. So the consensus was that both prop pitch and prop diameter had to be reduced as well, the point being to address the Yanmar’s higher rotational speeds (and the stresses they would engender) by, in addition to deepening the gear ratio, lessening the physical resistance to movement the props would encounter during operation. After a few calculations were made, a set of new 24 x 18 Michigan Wheel 3-blade props were ordered up and substituted for the old 28 x 22 ½ Stone Marine 3-bladers that were standard issue when Arawak was built. The idea behind going with fairly mainstream, albeit smaller wheels, was to generally reproduce the boat’s just-splashed performance, which was design-specific and cool with just about everyone, McCoy included. Higher speeds at top end and in the cruising range were not necessary. 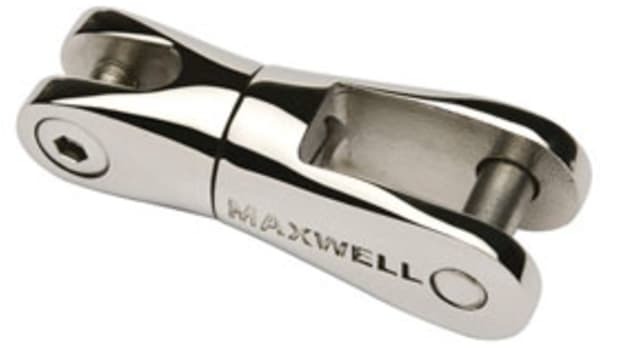 They would not have been compatible with the boat’s semi-displacement hullform anyway. The results of the modifications and substitutions that were made to Arawak’s propulsion system? 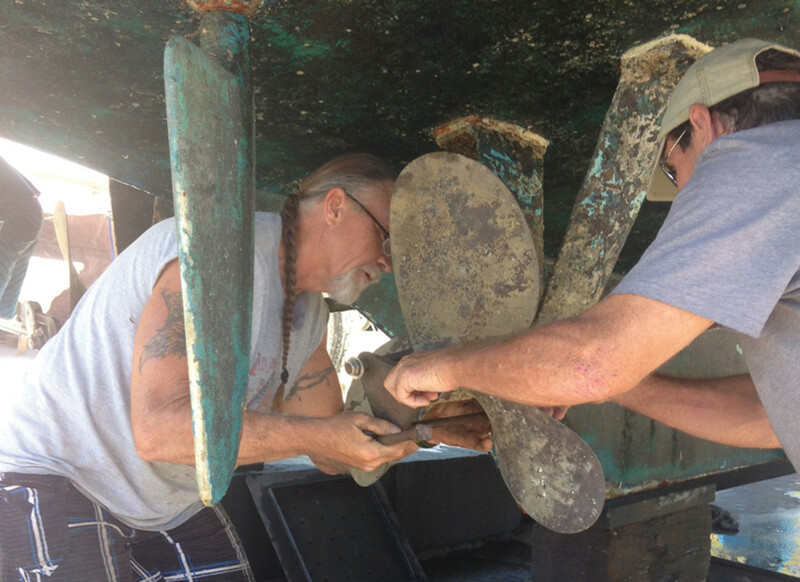 At press time, McCoy and a marine engineering specialist from Mastry Engine Center, Carl Schlemmer, were still fine-tuning Arawak’s components in St. Thomas, preparatory to a sea trial nearby and then a much-awaited departure for further rehab work in a Florida shipyard. By all reports, preliminary findings were tending toward the positive. An old, manufacturer-supplied sea trial from 1996 put the vessel’s maximum speed at 15 knots at 2800 rpm, with 12.6 knots and 11.1 knots reported at 2400 rpm and 2000 rpm respectively. During a much more recent, partial sea trial that took place shortly after the Yanmars were first installed by McCoy (but which had to be discontinued due to a transmission overheating issue), McCoy observed a level of performance that seemed to him roughly compatible with prior speeds and handling he was seeing onboard the boat. McCoy added that, although he and Schlemmer were still working at optimizing shaft angles and alignment, the job was going pretty well and he expected to hit the trail for Florida with Arawak soon. “Maybe in the next couple of days,” he added.